Forgive the bad pictures. How unlike me to leave my camera at home. But the truth is, I sometimes leave it just so I don't bug other people. Plus, I had no idea what to expect so I didn't bring it. Both Ivy and Jade take class from Miss Alexis at the Vibe. We absolutely LOVE her. She is so patient with the girls and understands the difference in the two girls and helps them both. Earlier this year Miss Alexis got engaged and the time has finally come. 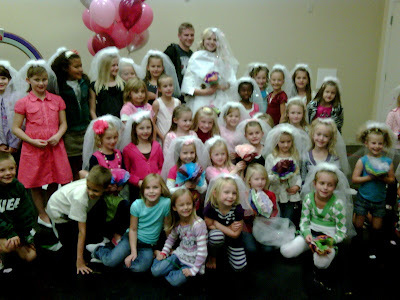 In preparation for her big day, she had a Bridal Shower at the VIBE and all of her students were invited. It was a great way to let the girls celebrate her wedding, without having a bunch of little girls running around the reception. Jade had gymnastics until 6:15 so we were really late. (It started at 5). They had done gifts and had a very nice buffet of treats and goodies. I'm not sure everything they had, because it was mostly cleaned up when we got there. 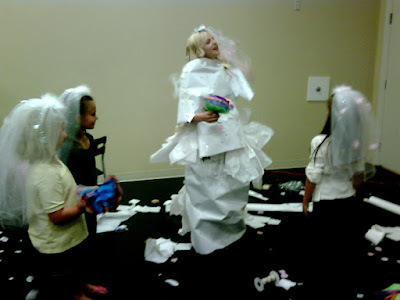 Each of the girls got to make a wedding veil. I was really impressed with what a great job they did making Miss Alexis' day special and making it fun for the little girls. When we got there, they were just getting ready to "dress the bride." Jade was in the skirt group and Ivy was in the veil group, but she changed groups so she could be with Jade. They had a blast and loved getting to help Miss Alexis celebrate. cute party! I loved catching up on your blog--you post such fun stuff! and those missionaries--WOW!